A special exhibition from Historic Environment Scotland ran throughout the summer at the Stirling Smith and finished on Sunday 12 August. Called ‘Stirling Builds’, it looked at many of the best-known buildings in the city from drawings of the pre-Reformation Church of the Holy Rude to the Wallace Monument competition drawings of 1861 to the Central Regional Council headquarters building photographs of 1975. There were even sketches of buildings which were planned but never built. The images were drawn from the archive of Royal Commission on the Ancient and Historical Monuments of Scotland whose purpose was to create an inventory based on measured survey of what were judged to be the most important aspects of Scotland’s man-made environment from earliest times to 1707. In recent years the Commission was amalgamated with Historic Scotland to become Historic Environment Scotland. 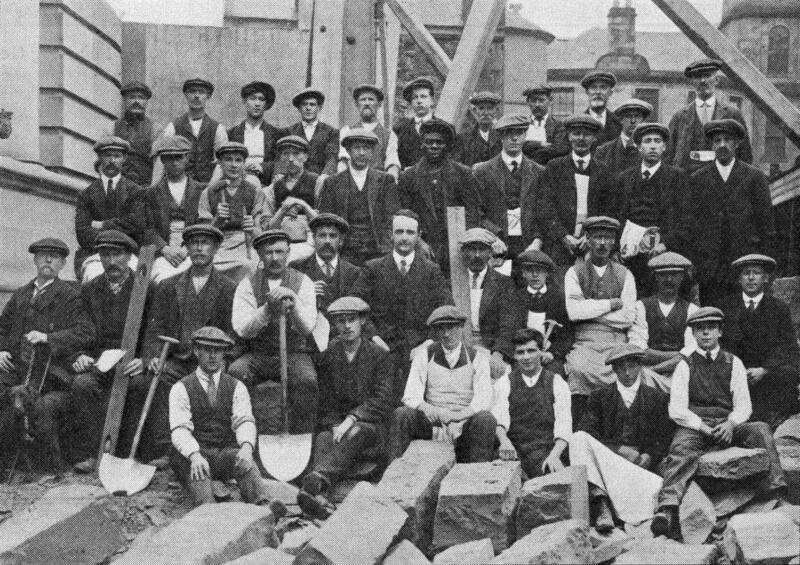 Most of the images were of buildings but shown here, from the Stirling Smith’s own collections is a photograph of some of the men who were at work on the Municipal Buildings in Corn Exchange before war was declared in 1914. All would be local men and there are some young apprentice boys. In the middle of the second back row is a Black man, unusual for Stirling at that time.